I don’t know about you, but I think the restaurant business seems like a tough business, even in the best of circumstances. So imagine this situation: You’re the chef and manager of a little waterfront restaurant in beautiful Southwest Florida. But you’re located deep inside one of the largest gated communities in our area, but you’re not associated with the community or its club. So you’ve got to figure out how to make it on your own when most of the town doesn’t even know you exist. That’s the situation I talked about with Cory Bass, the executive chef and general manager at Backwater Jack’s. Backwater Jack’s is located inside Bonita Bay, but isn’t part of either the Bonita Bay Club or the Bonita Bay Community Association. (There’s a whole history to how that happened back during the last recession,—ask one of our longtime locals to explain it). 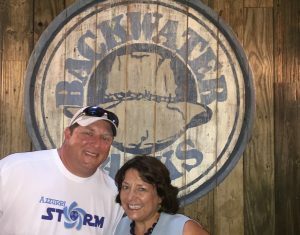 Enjoy my interview with Cory Bass at Backwater Jack’s, at Bonita Bay Marina. More about Backwater Jack’s (and you can sign up for Cory’s email on that page). Want to see how Coach Darcy is using email to keep in touch? Add your name to our insider list here.